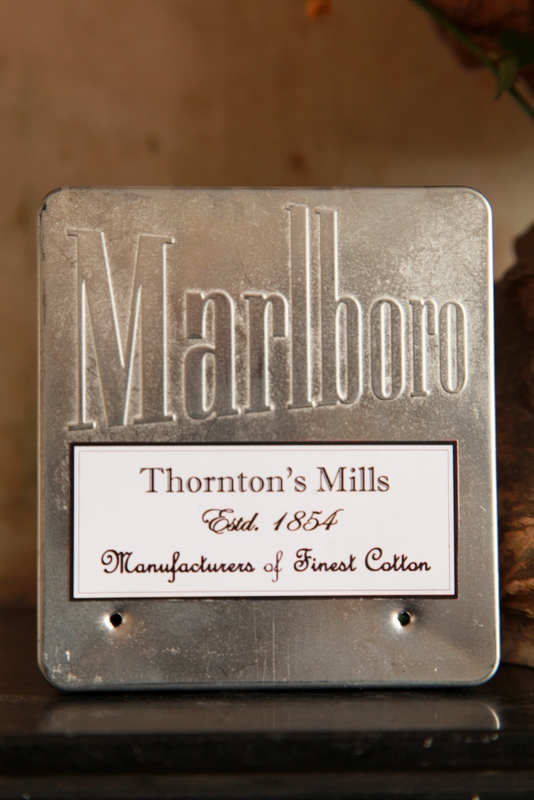 Mr Thornton believes in technological advancement. Is that responsible for him arriving quicker at his destination than John Standring? Plane and train has taken the Northern manufacturer much quicker to his destination than the shy Northern farmer. Is Standring still galloping along on sheep-back??? In any case, you may have already caught a glimpse of Mr Thornton – I just cannot bring myself to call him by his first name here, somehow he seems to demand the respect of the formal address – He arrived in Poland on Friday, and coaxed his hostess, Agzy, out of her current absence *yay*. Now that he is happily esconced in Casa Agzy I can show him off here, too. Marlborough Mills, of course. Please don’t hate me, but yes, I smoke. Here is the highly respected Northern gentleman, rubbing shoulders with a bust of my husband’s grandmama. Not quite Victorian, like himself, but classy enough, I hope. 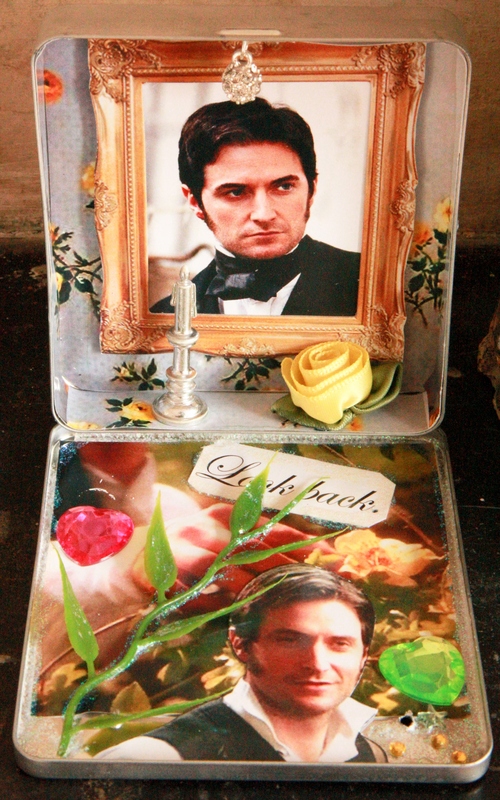 For the shrine I recreated a Victorian interior – with Victorian wallpaper (genuinely a pattern from the time) and a silver candlestick, Mr Thornton himself all haughty in a gilded frame, hanging on the wall. But since he is not just the “overbearing master”, but quite the lovely, love-struck man, he also had to be represented sans cravat, his eyes full of love, looking at his beloved. 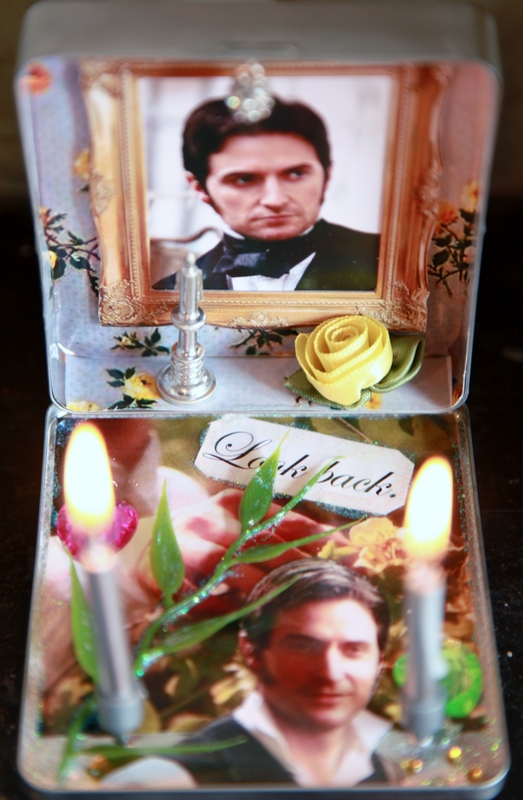 There we are – a proper little altar to worship Mr Thornton from, lit up by candles and sparkled over by the mini-disco ball. I hope it will get lots of use in Agzy’s shelves of Admiration… Read Agzy’s post here and see what else she has collected for her Armitage display case. With the end of the month near, I find again that work has piled up, and I am way behind with my shrine-making as well as my *ooof*ing. Not sure if I will make it tomorrow with an *ooof*. Please forgive me! Lovely! Or should I say adorable? Thank you! *hehe*, I think my husband would not rise to *that* challenge. One of my husband’s cousins builds dolls houses from scratch. They are little works of art, really. I love, love, love the framed portrait touch…Victoriana all the way! You’ve excelled yourself there, Guylty- clearly you have oodles of patience to achieve such charming results in such a tiny space! Love the period wallpaper, and the man in the frame, needless to say. 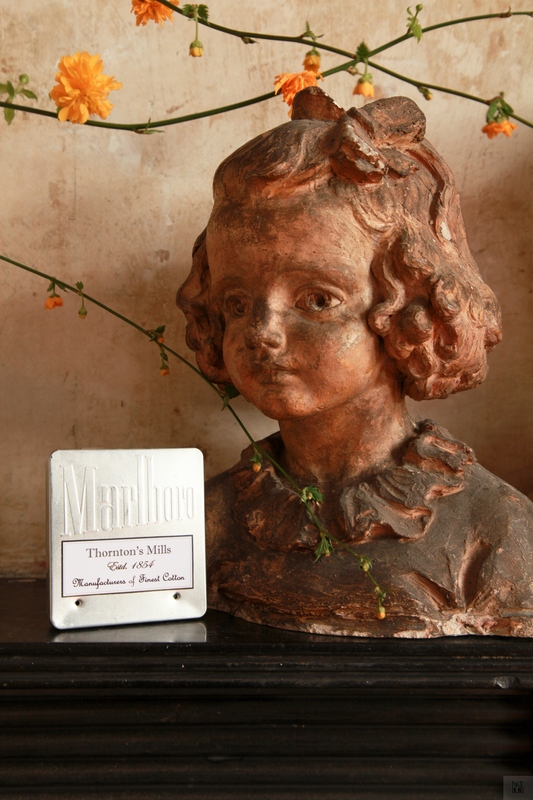 I made Thornton the same time as Harry Kennedy, and both those shrines are favourites. Also, the Porter shrine with half-naked Porter on the cross (*ugh* that *really* sounds weird) is a favourite. It probably took me a while to get the hang of it. Also, it is easier to make the slightly bigger shrines than the tiny ones. More scope for creativity. Merci April 🙂 I think the design will be copied a few times. I love this one, including all the symbolism. drooling and oofing over Thornton.I confess I stopped holding my breath waiting to see Standring>I fear my first RA love is lost somewhere !!!! This is the most beautiful Shrine so far, and because of the featured chaRActer! It threw the app off. Such is the power of smoulder. I freakin’ LOVE that shrine, no lie!!! It puts a smile on my face each and every time I walk past it 🙂 It looks particularly beautiful when the lights are dimmed and the candles are burning. It’s such a beautiful gift from a dear friend! Aw, it makes me very happy that you like my little gift, Agzy. Nice idea about darkness and candles – next shrine will be styled, set up and photographed in the dark with the candles burning. I don’t smoke but I am ready to start it if “cigarettes” look like this. Sure this is VERY good for health !!! 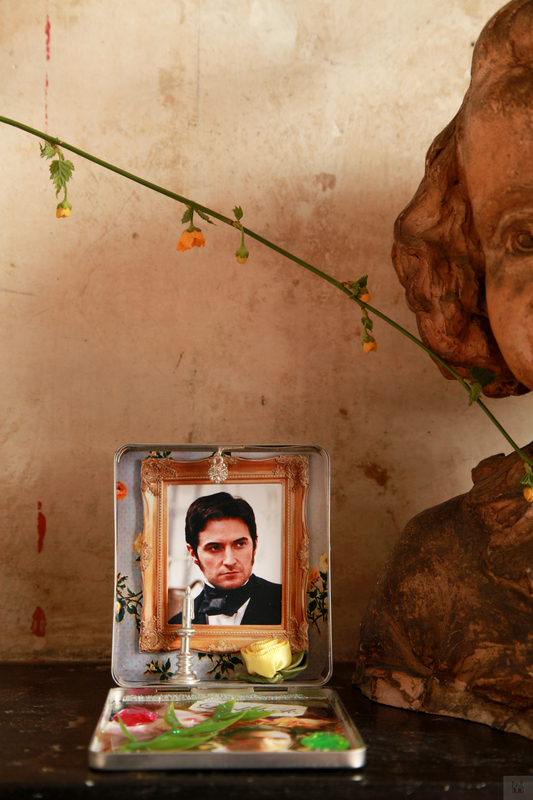 I LOVE your shrines, but I couldn’t have one – it would be the final straw for my poor put upon husband. 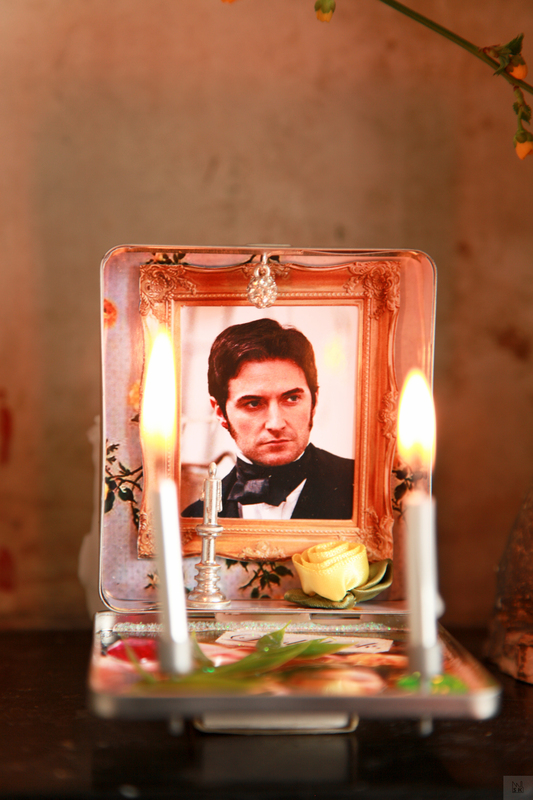 He is sick of Armitage mania, so is my son!! I think I am going through a strange mid life crisis. I always go for men who are dark haired, pale faced, with nice dark brows, great cheek bones and jaw line, clever and with gorgeous artistic hands. Ironically this describes both RA and my husband (a brilliant cartoonist). One is more perfect looking. One is 6 foot 3 ins, one is 5 foot 9 inches. I LOVE tall men!!!! My husband’s only weakness! I have a ton of beads to spare, if you need some, if I can find them, as I got into jewellery making then have stopped because I am getting more and more sensitive to metals other than high carat gold. Hello Lemonjapp – welcome to the blog.